Tech ARP Events - Click HERE For Contests, Events + Promotions! in: Tech ARP Events - Click HERE For Contests, Events + Promotions! 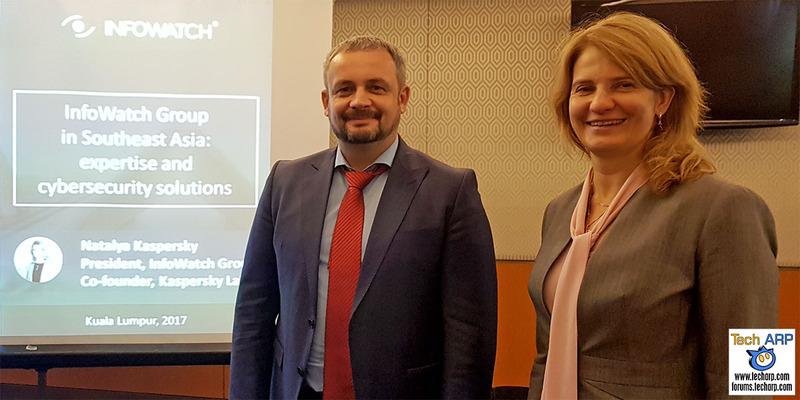 InfoWatch, the Russian cybersecurity and data loss prevention pioneer, just announced that they have set-up their first Southeast Asian base here in Kuala Lumpur. InfoWatch Group President Natalya Kaspersky flew in to make the announcement at IFSEC South East Asia 2017, and share the new InfoWatch report on data leaks in Southeast Asia. Natalya Kaspersky is not just the Group President of InfoWatch, she was also the co-founder of Kaspersky Lab. She is a very influential figure in the Russian IT industry, and one of the wealthiest women in Russia. The key announcement at IFSEC South East Asia 2017 is the establishment of the first InfoWatch South East Asia base in Kuala Lumpur under Vladimir Shutemov, the InfoWatch Labs Chief International Business Development Officer. Based out of an office in the Ilham Tower, InfoWatch SEA will be a 10-12 strong team primarily focused on sales and marketing in Malaysia, Indonesia, Sri Lanka and Vietnam. During our informal chat, Natalya revealed that Malaysia was a natural choice because of her past experience with Kaspersky Lab in Malaysia. The InfoWatch Analytical Center has been releasing global data leak reports on a biannual basis since 2007. And now, for the first time, they released a data leak report specifically for South East Asia. This report is based on over 10,000 cases that have been publicly announced. Although that only represents 1% of all data leaks globally. the report gives us a valuable statistical sample of the data for analysis. The new InfoWatch focus on South East Asia will help companies in this burgeoning region prevent data leaks from within their organisations. If you like our work, you can help support our work by visiting our sponsors, participating in the Tech ARP Forums, or even donating to our fund. Any help you can render is greatly appreciated! Next : The Walking Dead: Season 1 Is FREE For A Limited Time!